Finally a porcelain vent cover that matches your porcelain tile floor perfectly. Finally a porcelain vent cover that matches your porcelain tile floor perfectly. Our Flush Mounted floor vents add style to any tiling project. Each vent is made from the floor tile you've selected and designed to lay flush with your floor. Beautiful, durable and easy to install all of our Flush Mounted floor vents come complete with a sturdy steel back support and a separate diffuser (dampener) levelling plate which allows you to control the air that enters into a room. Adding porcelain or ceramic Flush Mounted vents to your new floor will give your room an elegant final touch. Build a custom wall or backsplash using this Merola Tile Alloy Quad 11-7/8-inch x 11-7/8-inch x 8 mm Stainless Steel Over Porcelain Mosaic Tile and enjoy peace of mind that it will repel water and resist damaging frost thanks to its impervious design. The beauty of the tile's medium-sheen, unglazed smooth finish and uniform appearance in tone elegantly blends with and complements a variety of decor. The Merola Tile D'Anticatto Hex Bianco 11-inch x 12-5/8-inch Porcelain Floor and Wall Tile radiates rustic charm. This oversized beige hexagon tile features muted rust colored accents and a smooth matte finish with imitation scuffs throughout for an aged appearance. There are twenty six different print variations that are randomly scattered throughout each case. DAnticatto Hex Bianco is suitable for indoor and outdoor locations including walls, floors, patios and pools. This tile can be used alone or with other tiles in the DAnticatto Collection to create a unique installation. Porcelain vent cover made to match Estrusca Villa tile. 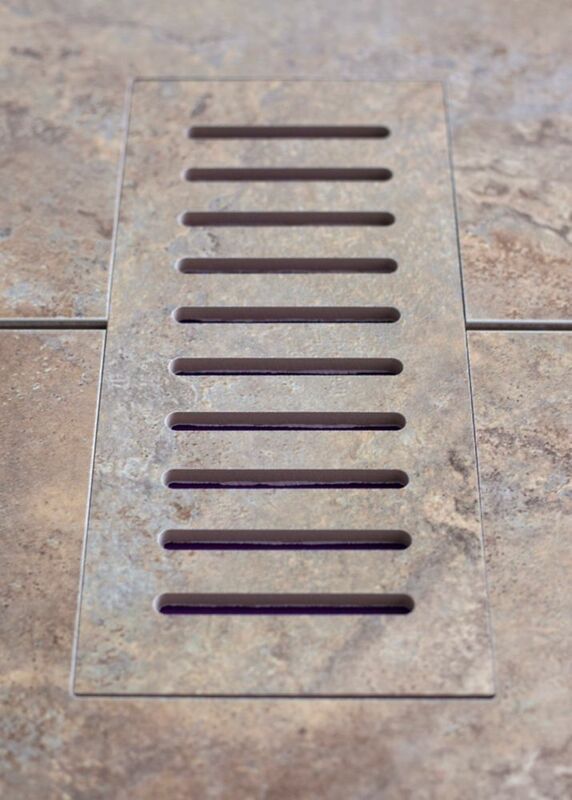 Size - 4-inch x 11-inch Finally a porcelain vent cover that matches your porcelain tile floor perfectly. Finally a porcelain vent cover that matches your porcelain tile floor perfectly. Our Flush Mounted floor vents add style to any tiling project. Each vent is made from the floor tile you've selected and designed to lay flush with your floor. Beautiful, durable and easy to install all of our Flush Mounted floor vents come complete with a sturdy steel back support and a separate diffuser (dampener) levelling plate which allows you to control the air that enters into a room. Adding porcelain or ceramic Flush Mounted vents to your new floor will give your room an elegant final touch.